What type of yoga does Yoga Studio teach? How should I practice yoga with Yoga Studio? Can I use Yoga Studio app while pregnant? How do I see the new classes added? How Do I get the Earth Meditations on a second device? Is Yoga Studio app compatible with Apple Watch? Previously owned Yoga Studio on iOS, but now seeing subscription page? Previously owned Yoga Studio on Android, but now seeing subscription page? Is an internet connection required to play a class? Can I play a yoga class on my TV? Is Yoga Studio app compatible with Chromecast? Can I play a yoga class on my Mac or PC? How do I delete downloaded classes and custom made classes? Can I install Yoga Studio on my Android device's SD card? I can't hear any audio while the class is playing. I can't play a class. It tells me the class failed to load. Help! Can I sync Yoga Studio app across devices? Does Yoga Studio app support other languages? Where can I find the Yoga Studio app stickers? Do I have to buy Yoga Studio again on Android if I already bought it on iOS (or vice versa)? Yoga is the connection of the body, mind and breath through a series of guided poses and sequences. Yoga encourages increased body awareness while also improving strength, flexibility and balance. There are many types of yoga, each with different focuses and benefits, however most revolve around the central idea of connecting the body, mind and breath. While there are many different types of yoga, each with unique benefits, Yoga Studio borrows elements from the following types in order to offer a variety of classes with different goals for all levels of ability. Vinyasa · wonderful for strengthening the body. Yin · great for joint flexibility and mobility. Yin yoga focuses mainly on the hips, pelvis, knees and lower back in order to increase joint range of motion, increase body awareness and learn to just let go. Through holding poses for longer periods of time connective tissue is stretched while chronic held tension is released. Relax and renew with this more passive style of yoga. Nidra · a deep relaxation technique. Yoga Nidra is widely known as “yoga sleep” or “sleep with awareness.” It is an element of yoga involving deep relaxation in order to relieve both physical and mental tension. Practicing this relaxation technique is believed to improve the quality of sleep and aid stress management. Absolutely! In fact, you are the perfect candidate for yoga. Give it a try and over time you will notice that yoga helps you to become more flexible. Everybody is different, so never feel the need to practice poses exactly like the teacher: she is only there as a guide (and has been practicing yoga for over 10 years). Listen to your body, don't force yourself and stay within your limits. Also, like any other exercise program, please consult your doctor before beginning to practice yoga. Wear loose fitting, comfortable clothing, kick off your shoes and practice on a surface with some grip. Yoga mats are ideal, as they are “sticky” and help prevent sliding. You can find decent yoga mats from around $20. 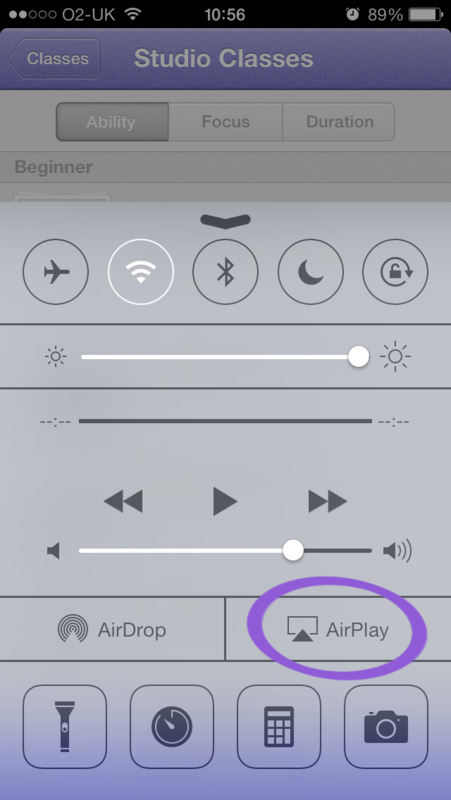 Turn your iPhone or iPad to landscape mode, prop it up near the corner of your mat and tap play. If youʼd like to practice regularly, simply schedule your classes in your calendar and Yoga Studio will remind you when to roll out your mat and get started. This is entirely up to you, however, avoid eating 3-4 hours beforehand. This is because you will be twisting, bending and turning upside down - things that are not very comfortable with a full tummy. Some people enjoy early morning sessions, yoga before lunch or a relaxing class just before bed. It is recommended to practice yoga as consistently as possible. Some like to practice 2-3 one hour long classes per week and some thrive on 10-15 minutes every morning. Just find a time that works for you and schedule your classes so you don't forget. YES! While Yoga can have many benefits for mom and baby during pregnancy, there are many poses and transitions that need to be avoided. Yoga Studio app was not designed to be used during pregnancy (NEW) however, we've designed a Prenatal Yoga Collection for those looking to keep their practice going in all stages of their pregnancy! The classes were designed with safe and mindful poses to support you and your growing baby but with all physical activity, prior to use please consult your doctor. These are available on both iOS and Android. If you are a subscriber (by selecting a recurring plan) you will automatically see the new classes upon updating Yoga Studio. If you purchased Yoga Studio when it was a one-time payment, the new content is optional and you will need to select a new subscription plan. Don't worry, you only need to purchase once. Your purchase will give you access to the Earth Meditations on our universal app for iPhone/iPad or on Apple TV (4th Gen). This will let you restore any purchase you've made in Yoga Studio. Just make sure you're using the same iTunes App Store account on your devices and you will now have access to the Earth Meditations on your devices. Make sure to purchase the collection soon, exclusively available until April 24th. Thank you for supporting WWF!! An internet connection is required for the initial download of each class. However once a class is in your Studio, you do not need an internet connection to play it. So head outside and use Yoga Studio in the park! 1. Turn your device all the way off (hold the top button for a few seconds until the "slide to power off" slider appears, and slide it) and back on again (hold down the top button for a couple of seconds again). 2. Keep the app open while the download progresses - this isn't normally required but can help if internet connections are slow. 3. If you are using a cellular connection (3G) you might want to consider connecting to Wi-Fi (maybe at your local library or coffee shop). 4. If you are having problems on a Wi-Fi connection try turning your wifi router off for 30 seconds and then back on again - wifi routers can occasionally be temperamental and this often helps. 5. Make sure you have enough available memory on your device. Your device will not always let you know that there is not enough space and the class will fail to download fully. Try deleting a few classes or free up a bit more space and try again! If you're still having trouble, contact us so we can offer some help! 1. Swipe up on any screen to reveal control center (see below) . 3. 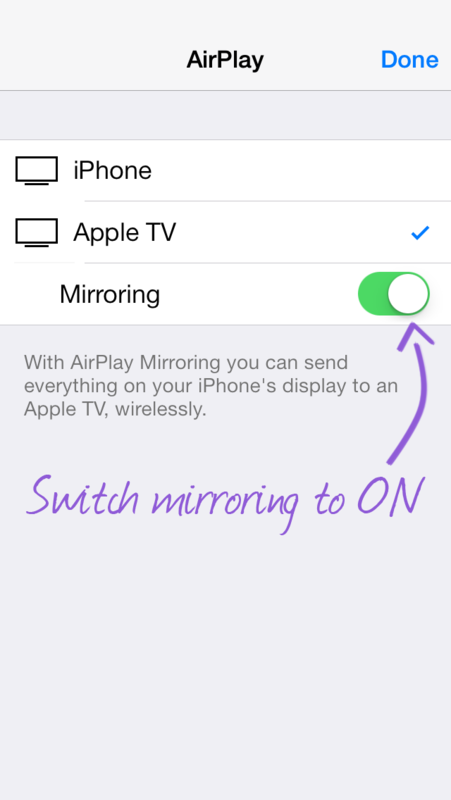 Select "Apple TV" and switch mirroring to ON. If you have an Apple TV 4th Generation or later, you can download and play the app directly from your Apple TV. Just find the app in the iTunes store! For Android users, if you have a Google Chromecast, you can Cast any ready -made class from the player or you can Cast your Android screen (including custom classes) from the Google Cast app using these steps. We don't have a mac version of Yoga Studio yet, and mirroring from an iPhone or iPad to mac isn't supported at the moment by Apple. We do have a version of Yoga Studio for PC and devices running Windows 10, you can download on the Windows Store. However, there is a way to mirror an iPhone or iPad to a Mac or PC using a third-party app called AirServer. We've tested this out on a mac and it works great. Note: we have no association with the developers of AirServer. How do I delete downloaded classes and custom-made classes? On iPhone, In Studio, swipe from right to left across a class to reveal the delete button. On iPad, In Studio, tap and hold your finger on a class for a second to reveal the delete button. On Android devices, select the Studio tab from the main menu. When the list of all your downloaded classes appears, tap the pencil icon in the top right hand corner. Then tap the trash can icon to the right of the class to delete any classes. For Windows 10- At the moment, we only have the option to delete all the downloaded classes in Windows 10. If you go to your "Settings" tab, under "Data" there is an option to remove all your downloaded sessions. With our next update, we should hopefully have the option to delete classes individually. Yes, you can move Yoga Studio to your phone or tablet's SD card like any Android app. For sound issues there are a couple of things to try. First, it's really easy to have the phone muted without realizing it, so check the mute switch on the side of the phone. It should be in the off position with no red showing. If in doubt just toggle the switch to double check it's in the right position. Second, while a class is playing, increase the volume using the buttons on the side of the phone. It's important to do this while the class is playing (rather than before it plays) to make sure the correct audio setting is being adjusted. This error is not common, but can occur from time to time. Please turn your device all the way off (hold the top button for a few seconds until the "slide to power off" slider appears, and slide it) and back on again (hold down the top button for a couple of seconds again). This should fix the error. We are not currently set up to sync your calendar or log book across devices. The Calendar in your app will only record and log the classes taken on that specific device. The app is currently saving your data. If we have this function in the future, the app should already have your history saved. You can share custom classes across devices. From the Custom Class screen, select the custom class of your choosing and tap “share.” This will prompt you to enter an email address, you can email it to yourself (or a friend with the app) and open/install the class on your other device. At the moment, Yoga Studio is only available in English. We would like to add more languages in the future- thank you for your patience! The latest iOS version has emojis for your text messages. Open the messages on your phone and tap the app store icon next the emoji icon. Click the store option and search for you Yoga Studio App- that should let you download the stickers. Yes. Android and iOS are very different platforms and require different resources to operate. Previously owned Yoga Studio on iOS or Android, but now seeing subscription page? YSA has since transitioned to a subscription model on iOS and Android to provide on-going class updates and new exclusive content offerings. As we value long-term support from users who previously purchased YS, we've implemented 'Restore' functionality so BOTH iOS and Android users will continue to have access to original content and app offerings. Please utilize the restore button located on the subscription screen to gain access to original collections. If you are having issues, please make sure your Android or iOS device is updated with the newest Yoga Studio release. If you'd like to see new classes whihc are added frequently please subscribe to get the latest and greatest. Account log in / Create account on iOS? If you encounter a login/join page and do not recall creating a Yoga Studio App profile please do so (it only takes a few seconds). If you try to login and no profile exists, you’ll receive a ‘No account found’ message, but don’t worry, this isn’t tied to your purchase history but is merely a way for us to try and better communicate with you regarding updates and features. You can bypass this by creating a profile (click Join Now) or click Join Now, then tap the Back button in the top corner. You may encounter this screen until a profile is created. Also if you see the subscription screen in the process you can utilize restore (top corner) to validate any purchases. Once again this is something fairly new but will help us connect on all the future YSA goodness!